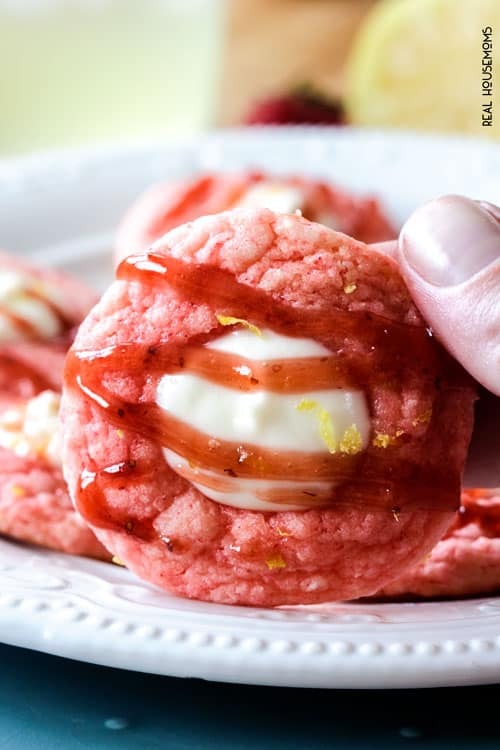 Easy Strawberry Lemonade Cheesecake Cookies are melt in your mouth, sweet strawberry cake deliciousness perfectly complimented by creamy tangy lemonade cheesecake filling. They’re the perfect summer cookie! I am all about cake mix cookies. They are some of the softest, moistest cookies around and they are so easy. And summer should be full of easy, carefree desserts. And strawberries. And lemons. And cheesecake And these pink cookies! 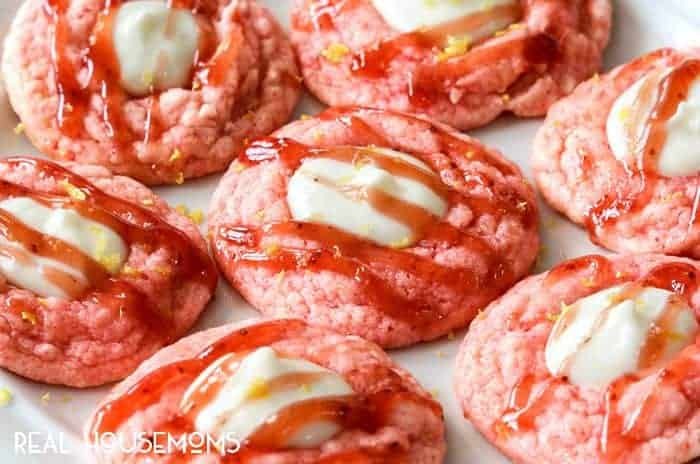 These Strawberry Lemonade Cheesecake Cookies look and taste impressive enough to bring to any want-to-impress gathering, yet they are easy enough for your kids to whip up. You simply whisk the cake mix with a few basic ingredients to make the cookies and after they bake and cool for 10 minutes, you take a teaspoon and press it into the cookie to form an indentation to hold your luscious, velvety no-bake cheesecake filling. 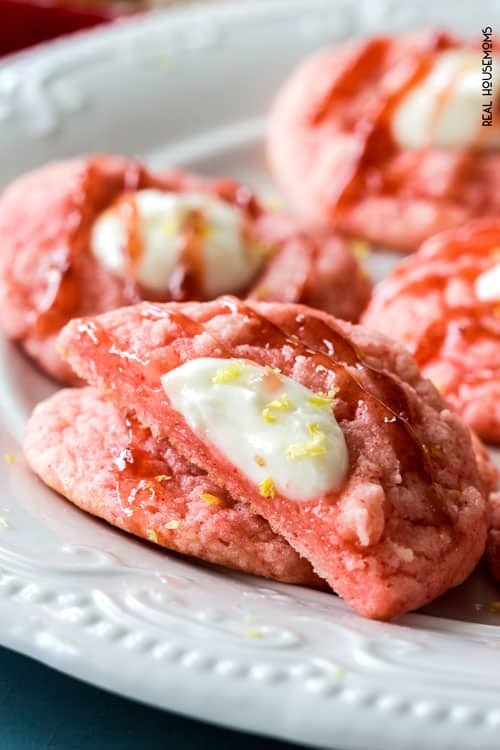 The filling is a simple mixture of cream cheese, sour cream, sugar, lemon extract and lemon juice so its infused with refreshing lemonade delight to perfectly compliment but not overwhelm the soft strawberry cake cookie. Chill the cookies for the cheesecake to set and you have soft, light, fall apart cookies that are fun, easy, delicious with a sweet lemonade cream cheese center. AND they are pink! Just looking at them makes me happy. Eating them makes me ecstatic. Get more delicious recipes like this one on our Real Housemoms Dessert pin board! In a large bowl, whisk together the cake mix, vegetable oil, baking powder and vanilla. Stir in eggs just until combined – don’t overmix! (Dough will be oily which is normal). Refrigerate dough for at least 30 minutes or freeze for 15 minutes. Meanwhile, prepare Cheesecake Filling by beating together all of the Cheesecake Filling Ingredients until smooth. Set aside. Working in 2 batches of 12, drop dough by 1 heaping tablespoon balls (dough will be sticky) onto a baking sheet lined with parchment paper or a nonstick mat. Refrigerate remaining dough until ready to use. Bake at 350 degrees F for 8 minutes. Let cookies cool on baking sheet (they will deflate) for 10 minutes then press down in the center of each cookie with the back of a teaspoon to make an indentation. Fill each indentation with a heaping 1/2 teaspoon of cheesecake filling. You can either remove cookies to a plate at this point or place entire baking sheet in the refrigerator to cool for at least 30 minutes – the longer the better for the cheesecake filling to set. Repeat with remaining dough for a total of 24 cookies. 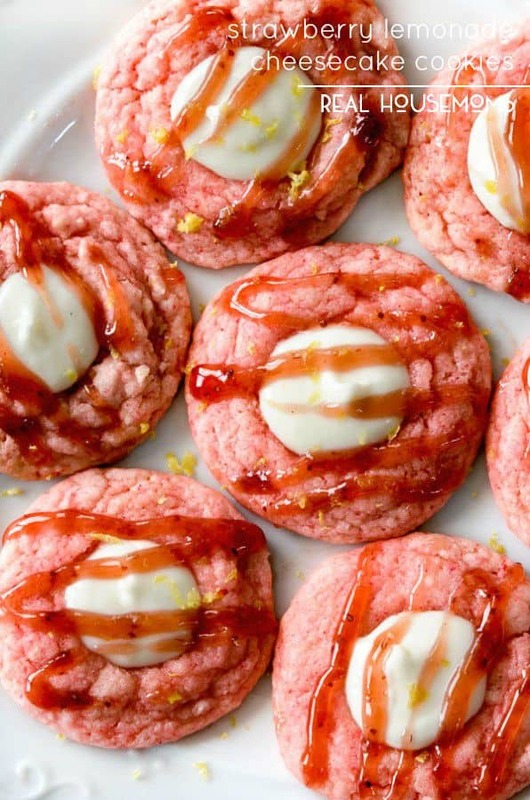 When ready to serve (or after cookies have been refrigerated 30 minutes), whisk together Strawberry Drizzle and drizzle over cookies. (I add Drizzle to a Ziploc bag, snip the corner to neatly drizzle). Store in the refrigerator in an airtight container for 1 week.